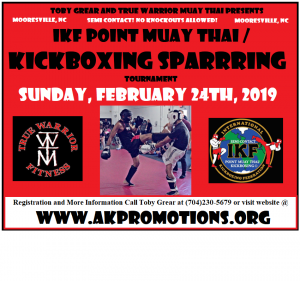 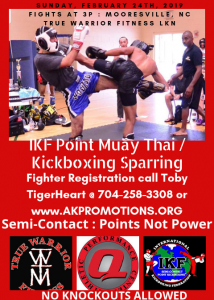 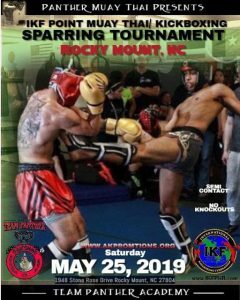 Join Mr. Toby Grear and his Warrior Fitness Muay Thai Club in presenting his first IKF Point Muay Thai / Kickboxing Sparring event in Mooresville, NC on Sunday, February 24th, 2019! 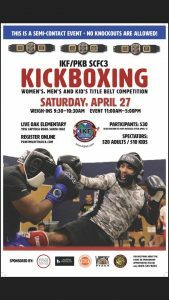 Men, Women and Juniors will compete for nice trophies and awards! 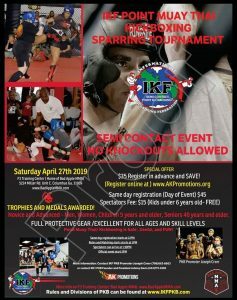 Registration starts at 1:PM to 2:30 PM- Rules Meeting and Matching Starts at 2:35 – Sparring Starts shortly after 3:PM – Spectators should not arrive until 3:PM.